Yes, until Get Outfitted is complete. 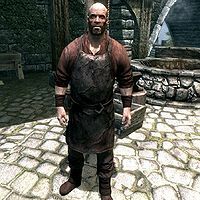 Beirand is a Nord blacksmith who runs the smithy in Solitude with the help of his assistant, Heimvar. He will give you Imperial armor after joining the legion. He is married to Sayma and has one son, Kayd. When you first enter Solitude, Beirand will be attending Roggvir's execution. Before it takes place, he will only say, "I've been waiting for Roggvir's execution. Talk to me later." Once Roggvir dies, he will comment, "A traitor right up to the end." and tell you, "He died well." After the execution, he will resume his schedule: between 8am and 10pm, he can be found working at the smithy. He then spends two hours at home with his family, chatting, relaxing, taking a nap, or having a bite. He goes to bed at midnight. Beirand wears a blacksmith's apron along with a pair of shoes. He carries his key to the Solitude Blacksmith, a key to his wife's store, Bits and Pieces, a belted tunic, and a selection of common loot and gold. In combat, he relies on a steel mace. While he is working at the forge, he will advertise his goods to potential customers, shouting, "I've got weapons for givin', and armor for gettin'!" or "Arms and armor! Forged by a master craftsman!" He will do the same if he notices you as well: "I got some fine armor, if you're lookin'. ", or "Need a weapon? Hmmm... By the looks of ya, yeah... Think I've got somethin' you can use." He can be heard musing, "It's good to be away from the forge for a bit." Should you approach him for conversation, he will comment, "Wanderer like you must have plenty of tales to tell. But I'm afraid I'm too busy to hear 'em." Depending on who controls Solitude, he will also remark on his seemingly endless job: "Seems there's no end to the needs of the Imperials. But what can I help you with?" if the Imperial Legion occupies the city, or "When the Stormcloaks took Solitude, I thought for sure things would slow down. But they keep me just as busy as the Imperials." if the Stormcloaks take over. When you bid him farewell, he will tell you, "Return anytime you need arms or armor. My forge never rests." or "Keep safe. And always wear your armor." If you offer to invest in his business, he will respond, "Such an investment will mean that I can take better care of my family, as well as my customers." Give him the gold and he will promise you, "You'll look back on this as one of your best decisions, I swear it." When asked if he has considered getting out there and fighting, he will reply, "I think I would, if it weren't for my son. And my wife." and continue, "Oh, Sayma would have my hide if I even suggested I might step foot on a battlefield. You think Stormcloaks and Legionnaires are dangerous? Ha!" You can also ask him about his job as an armorer. If the Imperial Legion controls Solitude, he will answer, "It's almost all I have time for these days. The men training here in Solitude and the troops out in the field, they all need weapons and armor." If you have not joined the Imperials, he will end by suggesting, "You should look into joining. They could use every hand they can get." If you have already, he will instead say, "But I'm not telling you anything you don't already know." Either way, you can ask him if he is dedicated to the Empire, something he will deny: "Ah... To be honest, no. But High King Torygg supported them, and now her lady Elisif has thrown in with them." He will explain his political stance: "You could say I'm a King's man at heart. Hmph. I guess that's 'Jarl's man' now. My loyalty lies with Solitude. So where Jarl Elisif leads, I follow." If the Stormcloaks have seized the city, he will instead reply, "These days? Aye. Most of what I make is for folk like you. There's still Imperial camps to be cleaned up, as you know. And that takes arms and armor." If you have just joined the Imperial Legion, you will be sent to Beirand to get outfitted. Tell him that Tullius sent you, and he will seem like he is expecting the visit: "Yep. I have just one question for you. Light, medium, or heavy?" If you ask him to clarify, he will do so: "Light armor for scouting detail, heavy armor for full on combat, or something in between?" Choosing light armor will have him respond, "Alright... here you go. Should keep you light on your feet, and hold up decent enough if you wind up trading blows with the enemy." while for medium armor he will reply, "Alright. This here's enough to keep your insides from spilling out, except from the fiercest of blows, and shouldn't weigh you down too much." He has this to say about his heavy armor: "They don't make finer steel anywhere else. If this doesn't keep you from dying, nothing will." Whichever set of armor you chose, he will end, "Now, that's it. One free outfit per soldier. You lose that, or get it banged up, you'll need to pay like everyone else." Sayma: "Sure has been quiet around the shop lately." OR "We hardly ever get new customers anymore." Sayma: "Not that I mind the break, of course. But, still..." OR "I suppose in wartime, people aren't looking to part with their old junk..."
Beirand: "We'll make it through, dear. We always do." OR "It's okay, dear. More work than ever down at the blacksmith." OR Kayd: "Who needs customers and their old junk?" OR "Father oughtta punch them in the mouth! That'd get people in here!" This page was last modified on 16 August 2014, at 22:58.